I wrote about making homemade flour tortillas a while ago, and have since made corn tortillas, too. The process is similar, but I think I like the corn ones better. They taste more authentic (I kind of think the flour ones taste like whole-wheat Eggo waffles), and they use water instead of oil, so they’re healthier and cheaper to make. I also made corn tortilla chips with some of my tortillas, which I promptly ate with homemade pico de gallo (delicious!). Note: when chopping jalapeños, wear gloves!!!! I knew somewhere back in the recesses of my mind that some hot peppers should not come in contact with bare skin, but glossed over that tiny detail in the hopes that jalapeños were not counted among them. News flash: they are. While chopping the peppers, I was fine. However, when I tried to wash the dishes I dirtied in hot water, I felt like I had torn cuticles on all of my fingers as the capsaicin reacted with the heat of the water. It then felt akin to having bad sunburn on all of my fingers. Not fun. I proceeded to Google how to relieve the pain, which meant looking like an idiot as I soaked my fingers in a bowl of milk while watching my Friday night movie selection. The burning sensation lasted into the next day and became a sort of nerve sensitivity even the day after that, preventing me from putting in contacts for a couple days. May you learn from my mistake and ensure that you don’t chop hot peppers (and remove the ribs and seeds) with your bare hands. 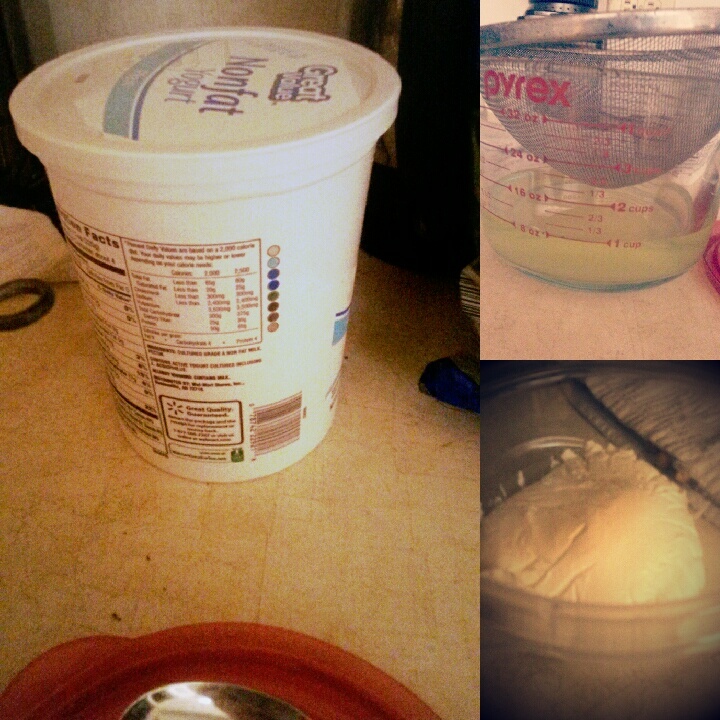 Also, I strained some regular yogurt to yield my very own Greek yogurt. It was thick and creamy, which was great, but it made so much less than the container I can buy at the store that I’m not sure it really would save me money. It did, however, produce about two cups of whey, which I proceeded to freeze in ice cube trays for smoothie and soup bases. I made some pretty tasty mixed nut granola, too. I toasted some mixed nuts, dried cranberries, and maple-syrup-drizzled oats in our toaster oven, and then added cinnamon and a little nutmeg when I removed it from the oven. The result was a nice crispy, slightly sweet, mostly nutty granola/trail mix combination. I probably should have upped the granola, since there are far more nuts than anything else. But it’s really delicious the way it is, too! I made some amazing roasted vegetables for a grill out that my friends complimented me on multiple times. Who would have thought that simple veggies would get such rave reviews? I simply chopped zucchini, yellow squash, baby sweet peppers, potatoes, and onions and seasoned them with basil, oregano, pepper, and thyme. We cooked them on cookie sheets (one for the potato & onion mix, one for the summer veggie & onion mix, since I knew the potatoes would take a lot longer) on the grill, which was surprisingly successful, since we had never cooked food that way before. I actually put a large spoonful on top of my veggie burger in lieu of traditional toppings of lettuce and tomato. It was a delicious grilled mess! And, true to form, I used my leftover veggies as pizza toppings. Mmmmm. Grilled veggie pizza. And just in case you think everything I eat is healthy, let me suggest a summer/fall treat to you that breaks that mold. I’m by no means the first one to try it, but I think everyone should taste one at some point: Reese’s Peanut Butter Cup S’mores. Yes. You read that right. I made mine with two marshmallows for extra melty gooey-ness. Part of the fun is trying to figure out how to eat s’mores without getting it all over, right? By adding peanut butter to the mix, I’m pretty sure I got a little taste of culinary heaven. 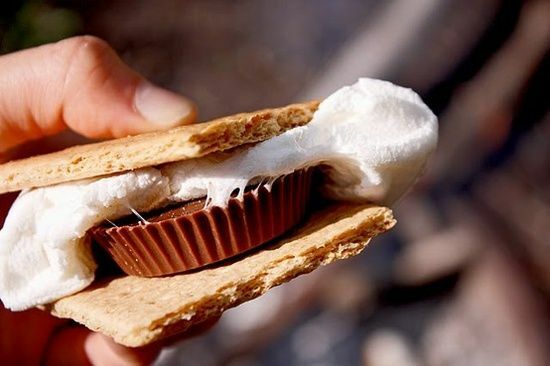 So the next time you’re prepping for a bonfire, don’t forget the Reese’s!